In a few weeks’ time I’ll be off on a last minute adventure to the Czech Republic! This will be my third time visiting the Bohemian nation, but my last visit was 14 years ago when I was 19 years old. This adventure will be a short (9 day), family centered trip but I’ll have some time to do a bit of city exploring too. You see, my dad is from the Czech Republic, born and raised, and all my family on my dad’s side still live there. I’ll be heading to my dad’s home town of Decin for a family reunion, located in the North West near the German border. While I’ve met some of my family before on my two previous trips, it’s been awhile and I’m looking forward to visiting with them and seeing the place where my dad grew up. 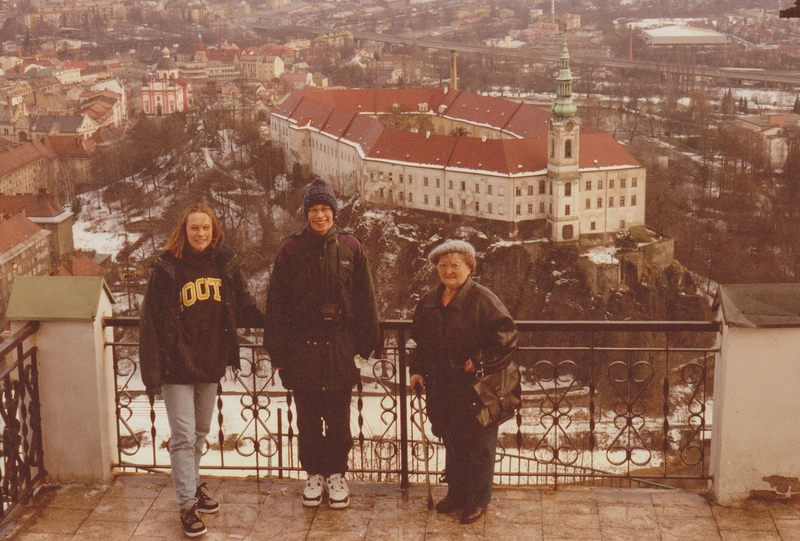 My Babitchka, brother and I over looking the Decin Castle (1997). My boyfriend and I will fly into Berlin, a city I’ve never been to before (though I have been to Germany). After spending a day exploring the incredible history and sites of this old city, we’ll head by train to my dad’s home town of Decin, Czech Republic. I’ll be getting the real “home stay” experience as I’ll be staying at my Babitchka’s (grandmother’s) house with a few other family members. Although she lives on the other side of the ocean, I have fond childhood memories of my Babitchka. I remember her coming to Canada to stay with us every Christmas when I was a kid. She would make the most delicious cookies! But even better, she’d make a box out of cookie and then fill it with the most incredible, sweet, sugar coated, cookies that would give any bakery a run for their money. I stayed with my Babitchka on my two previous trips to the Czech Republic and I’m looking forward to staying in a true, European home again. My brother and I outside the house my dad grew up in, where my Babitchka currently still lives (year 1997). My dad, brother and me with some cousins, my grandmother and her husband (year 2000). After spending a few days with my family and exploring Decin and the surrounding area, we’ll head off to one of the most charming and well preserved old world cities in Europe: Prague. Oh Prague, what an incredible city to be in! With it’s beautifully well-preserved castles, cobblestone streets, old town square and the infamous Charles Bridge, I’m sure I’ll log hours of aimless wandering. I’ll happily get lost among the sidewalk cafes selling fresh pastries, pubs serving the thirst quenching beers and medieval shops selling old world trinkets to new world tourists. 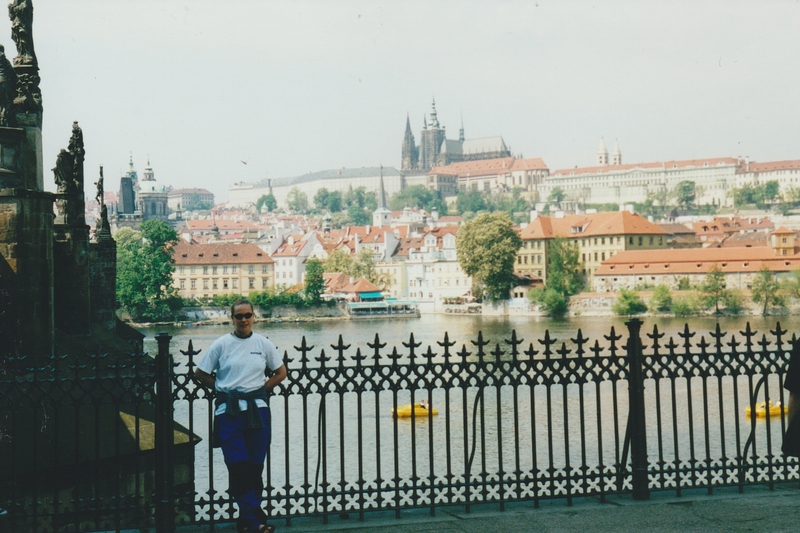 Me at 19 yrs of age (year 2000), standing beside the Charles Bridge with Prague Castle across the river. There’s one place I’m particularly excited about visiting in Prague. My museum! Ok, well its not actually MY museum, but it was started by a distant relative of mine, Vojtech Naprstek. The museum bears my family name (Naprstek) which is still pretty exciting! I mean, how many people can say they have a museum? The Naprstek Museum (Naprstkovo Muzeum) is located on Naprstkova Street in Bethlehem Square (Betlemske namesti) in the Stare Mesto area of the city, which is where you’ll find the Old Jewish Cemetery and the Astronomical Clock. The museum displays Asian, African and American art as well as cultural artifacts. Although I visited the museum on both my previous trips, time didn’t allow for us to tour the facility so I’m excited to be able to explore it on this trip and perhaps learn a bit more about my distant relative. My first time in Prague at age 16, posing in front of the Naprstek Museum. It’s even in the guide book! Its been a long time since I’ve been to mainland Europe and this time I’ll be traveling as an adult, making my own plans and itinerary. Even though I’ll be returning to two countries that I’ve “checked off” on the list, this will be a completely new experience for me. Every time you go on a trip, whether it be somewhere new or a place to which you return, your experiences, the people you meet, the serendipity’s that inevitably occur, are all things that no one but you has experienced. It will always make for a unique adventure and I’m excited to get out there and explore this Bohemian nation as it is today.